Find out the latest updates from CEM for peptide synthesis. 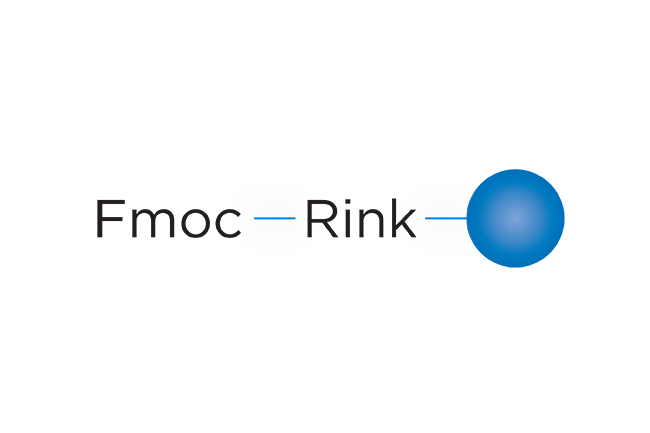 This includes Application developments for many types of peptides including the synthesis of N-methyl peptides, phosphopeptides, glycopeptides, peptoids, PNA, and more. 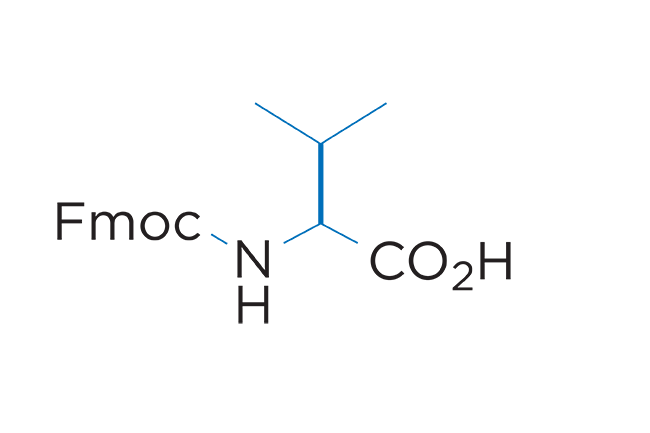 Additionally, stay up to date on new instrumentation development for CEM’s automated peptide synthesizers. Since its inception in 1963 by Dr. Bruce Merrifield, solid phase peptide synthesis has become a major enabling tool for making peptides. It has allowed for the development of automated peptide synthesizers which dramatically simplify production of peptides. CEM has pushed this technique further. Based initially on our developments in microwave energy for SPPS, CEM’s peptide synthesizers offer unmatched performance in terms of speed, purity, and efficiency. For this reason our peptide synthesizers have become the most widely used systems in the world. Today, microwave assisted peptide synthesis has become the standard in solid phase peptide synthesis. 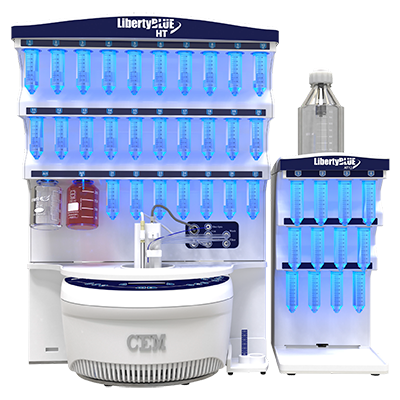 Its use was dramatically expanded after the introduction in 2013 of high efficiency SPPS (HE-SPPS) on the Liberty Blue peptide synthesizer which shortened standard cycle times to only 4 minutes along with dramatically reducing the waste generated. HE-SPPS also utilized advanced carbodiimide chemistry that simplified coupling of both cysteine and arginine with minimal side reactions even at 90°C. The introduction of CarboMAX coupling chemistry in 2016 provided even further benefits for acylation at higher temperatures. CarboMAX allows for faster formation of the key o-acylisourea intermediate in carbodiimide chemistry that leads to the formation of higher amounts of activated amino acid more quickly. This has demonstrated both reduced coupling times and less epimerization compared to standard carbodiimide chemistry. In 2018, CEM introduced a brand new one-pot coupling and deprotection methodology for SPPS. 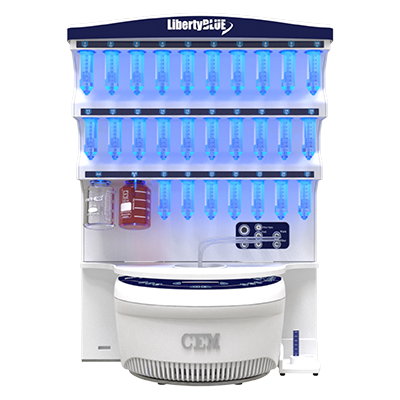 This new methodology is utilized on the Liberty PRIME peptide synthesizer and allows for unprecedented 2 minute cycle times with half the waste compared to even the Liberty Blue system. 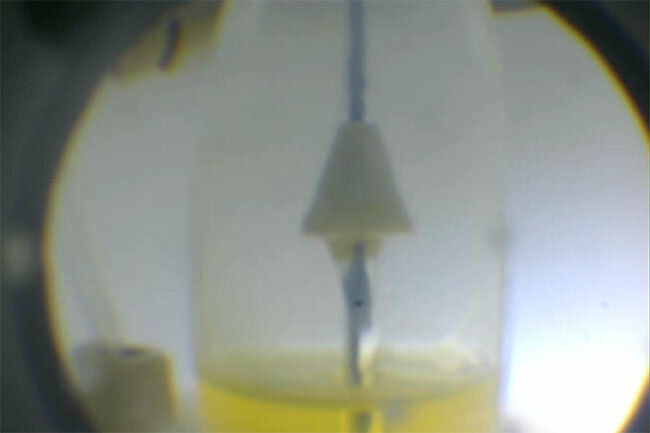 The ability to do this is based on the unique step of adding the base for deprotection directly to the undrained coupling solution that is already at an elevated temperature. This reduces cycle time by eliminating draining and temperature ramping between the coupling and deprotection reactions. It also reduces the solvent required since the coupling solution can effectively serve as the solvent for the subsequent deprotection reaction. 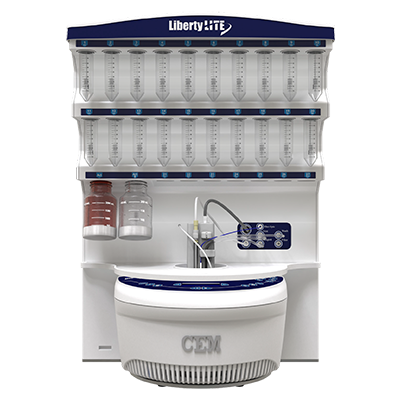 The resin loading capability incorporated into the Liberty Blue HT12 and Liberty PRIME synthesizers allow for automated fast sequential solid phase peptide synthesis. Fast sequential automated peptide synthesis has significant advantages over high throughput methods using parallel peptide synthesizers. Fast sequential peptide synthesis allows for single peptides to be made very quickly with the ability to begin purification after each peptide is completed. 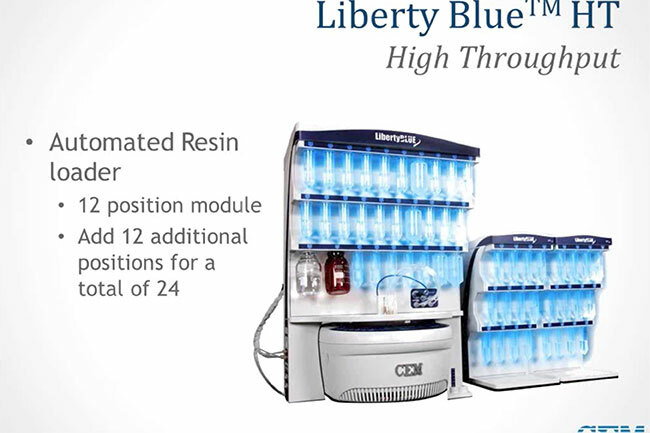 At the same time, the very fast cycle time achieved with the Liberty Blue HT12 and Liberty PRIME provide total throughput that can keep up with parallel peptide synthesizers. In addition to peptide synthesizers, CEM also offers a unique system for cleavage of peptides from resin. 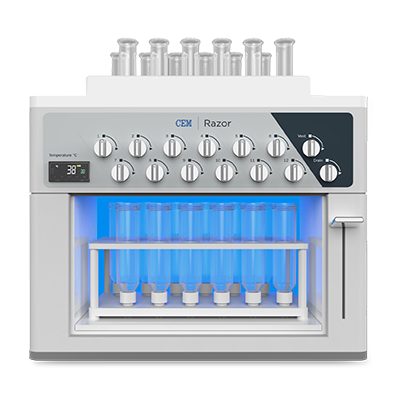 This system, Razor, provides for parallel cleavage of up to 12 peptides at elevated temperature with an integrated manifold for draining into collection vials. Using the Razor cleavage times can be reduced from 3-4 hours down to only 30 minutes with more complete removal of difficult side chain protecting groups such as Pbf and tBu. 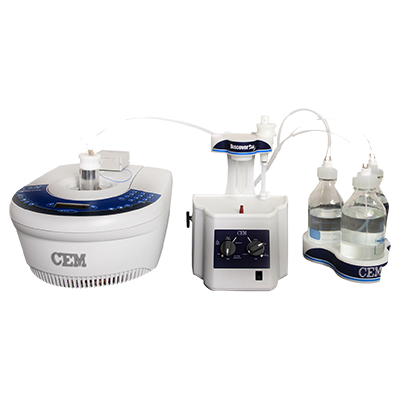 In addition to instrumentation, CEM offers a complete line of reagents including Fmoc amino acids, pre-loaded resins, and other reagents. From resins proven to increase product purity to instruments that shorten reaction times while increasing peptide yield to cleavage systems that remove peptides at the speed of light, CEM has the solution. Ultra fast 2 minute cycle time. Very fast 4 minute cycle time. Quick 15 minute cycle time. Pick the peptide synthesis system that’s best for you. Obtaining the best results from your peptide synthesizer requires the use of high quality starting reagents. 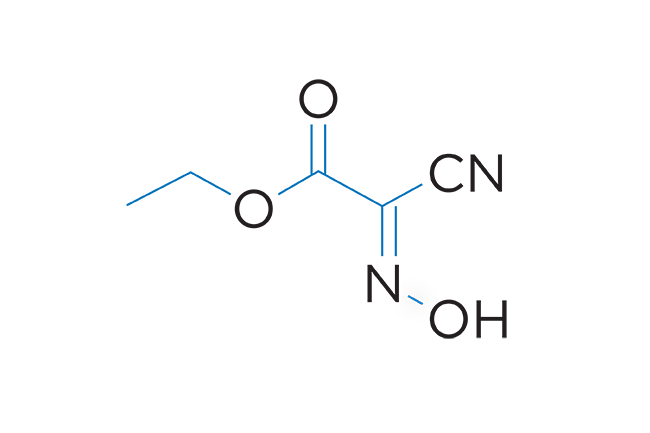 CEM offers a complete library of resins, Fmoc amino acids, and activator reagents. These reagents are optimized for elevated temperature synthesis of peptides with the highest purity. Pre-weighed for CEM peptide synthesizers. High performance ProTide™ PEG-PS resins. The best activator for elevated temperature SPPS. 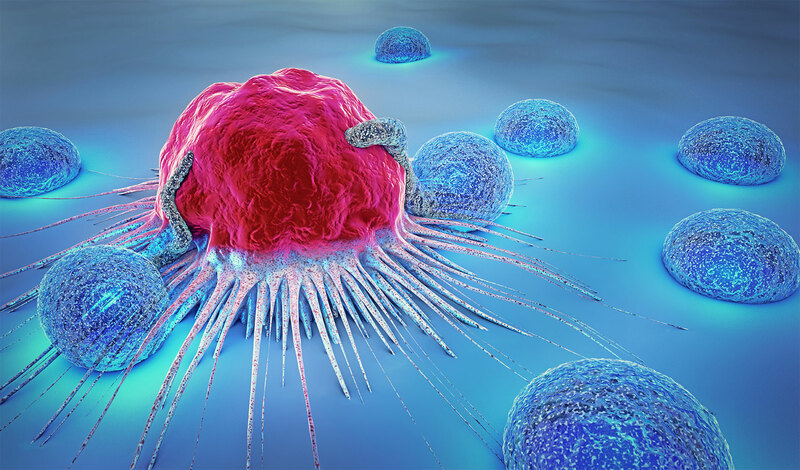 Learn more about microwave peptide synthesis and its benefits. CEM’s training videos include webinars with the latest chemistry developments in the field. 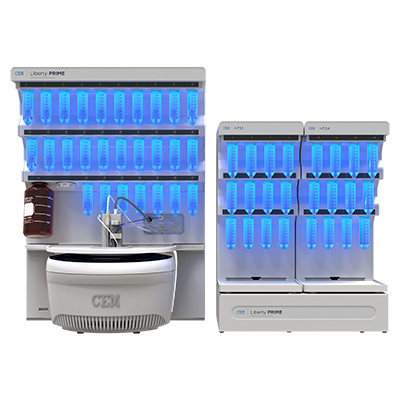 Also, learn more about CEM’s state of the art peptide synthesizers. This includes how fast sequential peptide synthesis can replace the traditional use of parallel peptide synthesizers.